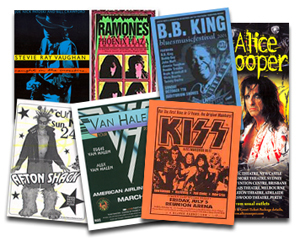 We carry a large collection of original concert handbills and miscellaneous paper items such as: Venue Postcards, Promotional Flyer's, Limited Japanese and European Concert Handbills, Dallas/Ft. Worth area, Arminski Day Glow Handbills, Avalon Ballroom and Fillmore Postcards. Once the item is sold, it is immediately taken off the site. All Items are Limited - Single Stock Items ONLY! No Multiple Items unless specified! All Handbills are Limited - Single Stock Items ONLY! No Multiple Items unless specified! We are currently adding more scans and links to our site, so thanks for looking and check back! Email us for bands that are not linked or listed. All items are priced and include shipping cost for all USA Customers. Overseas delivery is determined by final destination. All out of the USA customers will receive a PayPal Money Request once your initial payment is received. We charge actual shipping cost using Standard Air Mail. See our Policy page for shipping cost to all out of the USA orders. Texas Residents please add 8.25% sales tax to your total purchases price. Thank You. NOTE: All items in VG+ to Mint Condition unless otherwise noted. Scans available for all artists not listed on site by request.